As reported on our sister site, CityBike, the CHP released the lane splitting guidelines authorized by AB 51, now called “lane splitting safety tips,” just over two years after the bill passed. Lane splitting is a privilege enjoyed by California motorcyclists. With this freedom comes a greater responsibility for motorcyclists and drivers to share the road and create a safer highway environment. In 2016, Governor Edmund G. Brown, Jr. signed California Assembly Bill 51, which defined motorcycle lane splitting and authorized the California Highway Patrol (CHP) to develop educational safety tips. Through a deliberative process and in consultation with the California Department of Motor Vehicles, the California Department of Transportation, the Office of Traffic Safety, and several motorcycle safety organizations, the CHP has finalized lane splitting tips. As previously discussed here at great length, the reason this bill and the newly release guidelines are so important is that the CHP et al now (again) have the authority to educate riders and drivers in California using California motorcyclists’ money (from registration fees). The previous CHP lane splitting guidelines were beginning to have positive effects on both riders and drivers—you can read more about this in the OTS lane share surveys and Dr. Rice’s lane splitting research here. The new tips are disappointingly vague, and missing a critical component for new riders: guidance on top speed while splitting, and speed delta (how much faster the rider is going than surrounding traffic). Consider the total environment when you are lane splitting. (this includes the width of lanes, the size of surrounding vehicles, as well as current roadway, weather and lighting conditions). Danger increases at higher speed differentials. Danger increases as overall speed increases. Avoid lane splitting next to large vehicles (big rigs, buses, motorhomes, etc.). Riding on the shoulder is illegal; it is not considered lane splitting. Be visible—Avoid remaining in the blind spots of other vehicles or lingering between vehicles. Help drivers see you by wearing brightly colored/reflective protective gear and using high beams during daylight. Lane splitting by motorcyclists is legal in California. Intentionally blocking or impeding a motorcyclist in a way that could cause harm to the rider is illegal. Opening a vehicle door to impede a motorcyclist is illegal. Drivers in the far left lane should move to the left of their lane to give motorcyclists ample room to pass. Checking mirrors and blind spots, especially before changing lanes or turning. Signaling your intentions before changing lanes or merging with traffic. Being alert and anticipating possible movements by other motorists. Never riding/driving while impaired by drugs, alcohol or fatigue. Being courteous and sharing the road. 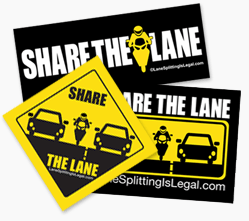 If you’d like to support our mission here at LaneSplittingIsLegal, order some lane splitting stickers and put ‘em on every vehicle you own and maybe even some you don’t—but you didn’t hear that from us! Every sticker we sell funds the distribution of free stickers around the state, not to mention keeping this website live. Thanks for your support! ‹ AB 51 Signed By Governor Brown! Lane Splitting Is Officially On The Books In California!